John Gibson, who graduated in 2010 with Honors in History, is currently in Switzerland on a Fulbright-Swiss Government Research Grant for 2011-2012. He is associated with the Institut d’histoire of the Université de Neuchâtel and the Historisches Institut of the Universität Bern, and has been going to the archives almost every day for his research on diplomatic networks of the French Revolution. This hasn’t kept him from enjoying Switzerland’s magnificent scenery on the weekends, however. 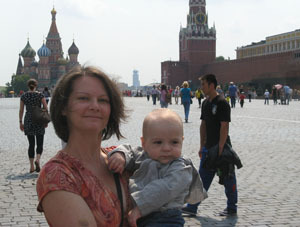 Nancy Locklin and her new son at Red Square. Nancy Locklin (PhD 2000) has just published an article, “‘Til death parts us’: Women’s Domestic Partnerships in Eighteenth-Century Brittany,” in the Journal of Women’s History, Winter 2011 (volume 23, issue 4). In even bigger news, she and her husband have adopted a baby boy from Russia. Congratulations on both counts, Nancy!